In the first major Apple store theft since the arrival of the new iPhones, several individuals carried out a robbery in Santa Rosa, and one suspect was caught. 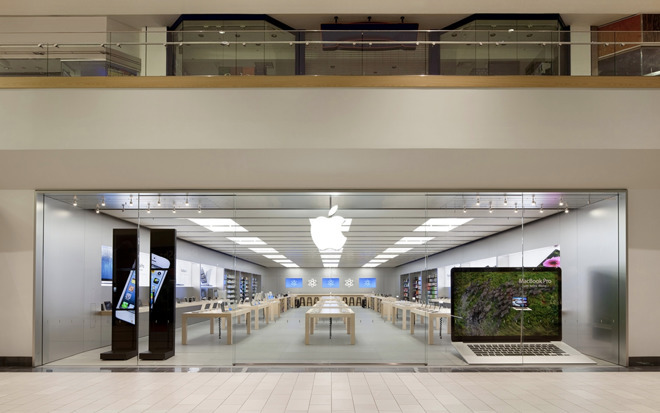 In another of a long series of similar robberies in California, several men rushed into an Apple store in Santa Rosa, Calif., on Sunday and stole merchandise from display tables before running off. But this time, a bystander videotaped both the robbery itself and one of the suspects being wrestled to the ground by security guards and civilians. The bystander, who uses the online username "Gooneryoda," filmed the videos and later posted them to Twitter, YouTube and Reddit. Later in the day, the Santa Rosa Police Department's Facebook page reported that "several thieves entered the Apple Store at the Santa Rosa Plaza mall and ran away with multiple devices." Dozens of similar Apple store robberies have taken place this year throughout California, and at least two crews carrying out the crimes have been arrested. The thefts have often been caught on store security video, but rarely have they been recorded live by bystanders. The same Apple store, at Santa Rosa Plaza, was similarly robbed in late August, with thieves making off with $35,000 in merchandise. Law enforcement sources contacted by AppleInsider in recent weeks are unclear on how many crews are at work and if they are connected. One officer, Lt. Robert Boll of the Burlingame Police Department, said there's likely a copycat effect at work. "They see how easy it is when the news plays the video," he told AppleInsider.